Global Climate Convergence Mother Earth Vigil covered by Charlotte Observer. 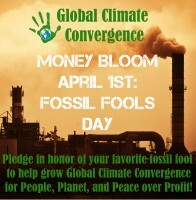 Coverage of Global Climate Convergence in The Taos News. $10 for 10 Days – 10 Reasons We Are Here to Stay! As Earth Day to May Day actions begin, local organizers across the country are starting to look beyond the mobilization at hand. We are receiving a steady stream of requests for the Convergence to continue our shared work – providing support for grassroots organizing, networking, and action on an ongoing basis. We are overjoyed at the prospect of continuing this work! Last week Convergence activists in Chicago staged an action outside of BP’s offices to protest the release of 500 gallons of tar sands oil into Lake Michigan from a BP owned refinery. Check out the full video of the Press Conference and local news coverage from WFLD Fox News at 9.